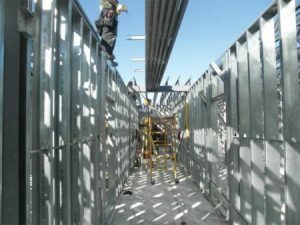 Cold-formed steel framing has been a viable construction material for more than a century, but some professionals may not fully understand all the benefits of its use. One of the major advantages is maximizing the timeline of a building project and saving money—even during a harsh Canadian winter. Cold-formed steel is dimensionally stable and does not expand or contract with moisture content; it will not warp, split, crack, or creep when exposed to the elements. Moreover, the material’s inherent strength provides architects and engineers with design flexibility. All building construction projects present different challenges, especially in some areas of the country, where it is common to experience temperatures lower than 5 C (40 F) seven to eight months of the year. Cold-formed steel does not require certain temperatures to dry, set, or cure. With appropriate planning, this material can help building professionals continue their projects throughout the tough winter months. Several considerations should be made to best utilize the material in multiseason construction projects.